took the form a bull. In most statues he was pictured with his head facing up toward the sun, and chest pushed out. This pose was considered a very noble and strong stance. The way priests would be able to recognize Apis, from other bulls, was from the mystical marks he was given. On his forehead he had a white triangle, on his back was a figure of a vulture with outstretched wings, his right side had a crescent moon, his tongue had the image of a scarab, and finally, the hairs on his tail were doubled. He is usually featured as black statue, with a sun disk on his head. His horns curled around the sun disk holding it in place. Apis was always featured having a long fluffy tail, with extra detail around the tip. Apis was an important mythical beast; he represented strength, fertility and vigor. He is a god of the dead, included in the Osiris cult. It is well known that the testicles of a bull contain an aphrodisiac. This is sometimes associated with Apis, being the god of Fertility. There were many bulls thought to be Apis, and each one was identified by the mythical marks. 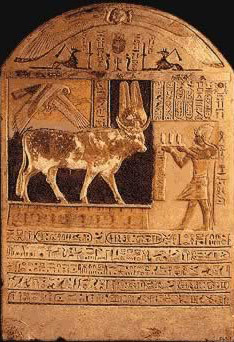 Each bull that was the reincarnation of the god Apis, was brought to the temple in Memphis that the kings had built. Apis’s temple was adjacent to that of Ptah’s. In the courtyard of Apis’s temple, he was allowed to roam around, going wherever he pleased. During his walks around the temple, his movements were thought to tell of the future. Scholars would spend great amounts of time trying to decipher his actions. Apis also brought a great amount of tourism to the area. People would come from all around the world to watch the future be decoded before their eyes. Apis was thought to be immortal; however his host body was expected to die. Apis was allowed to live until his old age killed him. However, he was sometimes drown when he lived too long, as a sacrifice, or cleansing process. He was shoved into a sacred fountain by his caregiver and smothered until dead. On two occasions he was assassinated, the first time he was killed by Cambyses, and second by Ochus. When the mythical beast died, a great ceremony was held to honor his life. Each time a new successor was found, it was a joyous event and a celebration was held in his honor. Apis was not known for having an intricate family, like all beings he was a child of Ra. His mother and father are not known because he was a mythical bull god; such family lines were not recorded. In 1850 a tomb was uncovered that had all the bodies of Apis in individual sandstone coffins. These bulls were said to be all the family that Apis had. The underground tomb that the sandstone coffins were in does not exist anymore. In the 1850’s there wasn’t a well known standard on how to handle ancient artifacts, so a lot of the coffins were sold to private owners, or destroyed for the jewels inside.